BlueStacks is a legitimate, free and easy to install program for Mac or Windows PC that enables anyone to run Android OS (Icecream Sandwich) and download over 450,000+ Android apps without the need for “dual-booting”, allowing Mac and Windows users to enjoy the full experience of an Android device! 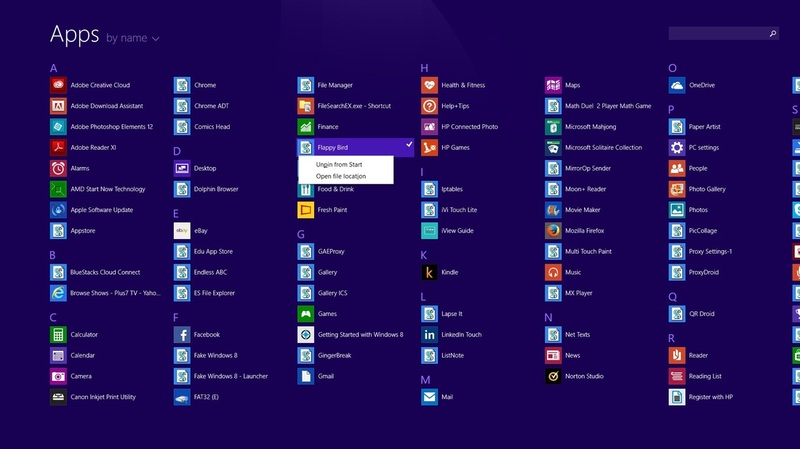 Amazingly, the Android apps even appear on the Windows 8 Start screen. 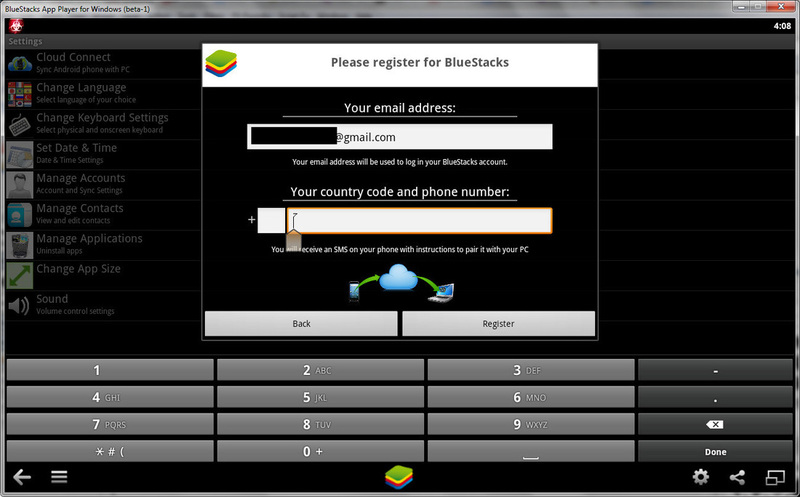 Why Install BlueStacks (Android) on a Windows or Mac PC/Laptop? Android is the world's most popular platform for smartphones (80% of the world market)  . Android is open source (its source code is released to the general public), allowing its operating system and software to be freely modified and developed (using Java and C++), leading to a huge selection of third party apps and over 1 million apps  available from Google Play. 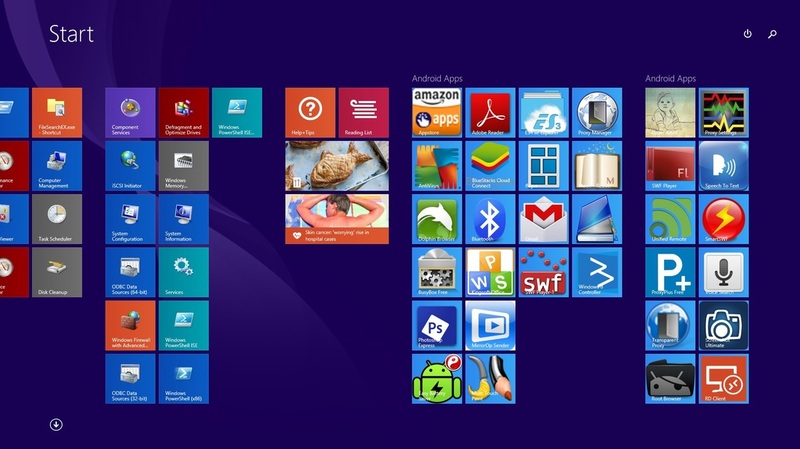 Third-party developers have created apps (for all devices) that mimic Windows (8, Surface: Metro RP, 7, Windows Phone and XP), Apple's IOS (6, 5, 4) and Linux, allowing Android users to feel like they are using the latest device (visit the Android apps section for reviews and links to awesome Android apps for educational settings). 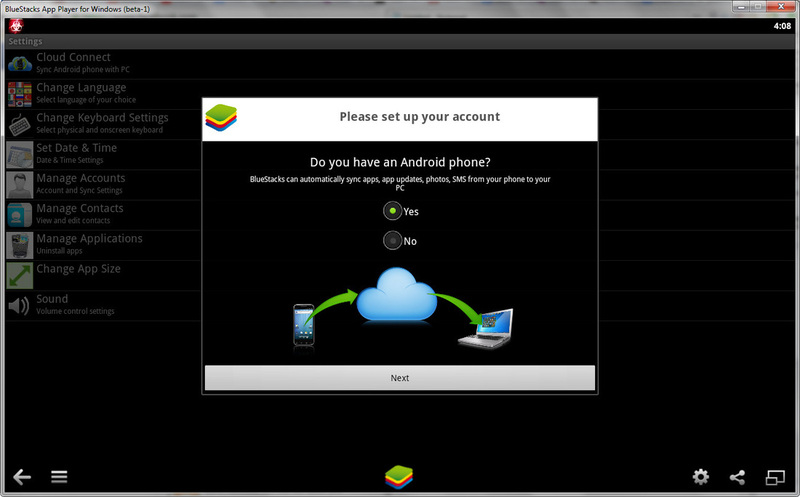 Installing apps from the Google Play store via a browser on a Mac or Windows PC as long as the users has BlueStacks running in the background and has signed into their Google Play account (Google Play will ask you to choose a device: BlueStacks is detected as a 'T-Mobile Samsung GT-19300'). The 'Z' or 'X' keys can be used to simulate tilting a device left or right. 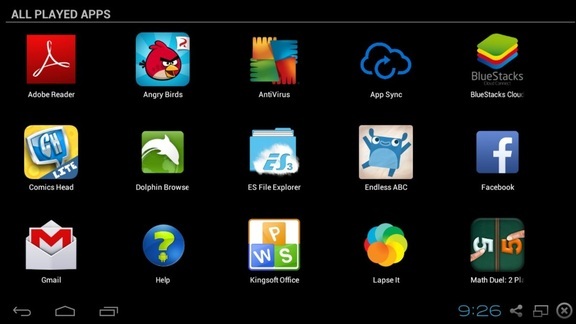 Existing android tablet and phone owners can also download the free app, BlueStacks Cloud Connect, which allows users to push apps from their Android device to Bluestacks on a PC/Mac, and vice versa. Simply associate BlueStacks on a PC/Mac with a Google Account so that users can access the Google Play store to sync and download apps. Note: If users choose not to sync apps to and from an Android device, simply use the built in 'App Search' to search for apps as well as categories such as 'Top Apps' and 'Spotlight' to install apps from Google Play, Amazon, or 1Mobile. Once users have entered a particular store (e.g. Google Play), they can then search within that store's app search bar. Below: BlueStacks running in full-screen mode. 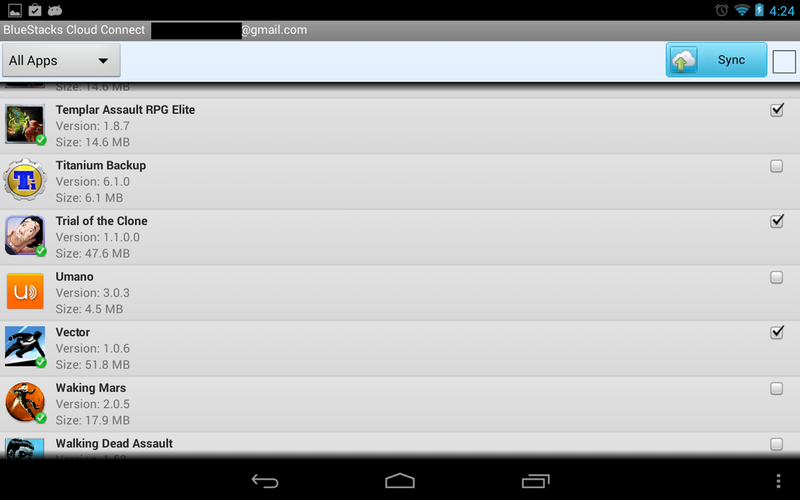 Click on 'All Aps' to view installed apps. 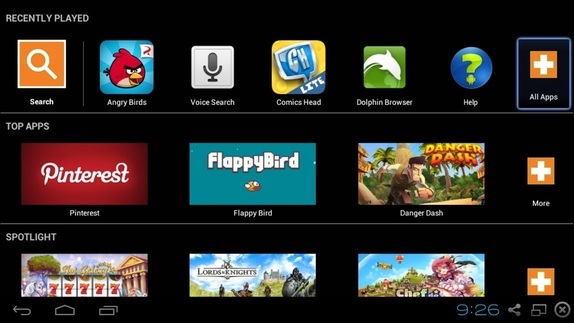 Below: BlueStacks Android apps installed from the Google Play store. With over 5 million people using BlueStacks to date, follow the download instructions below to use Android on a PC or Mac. 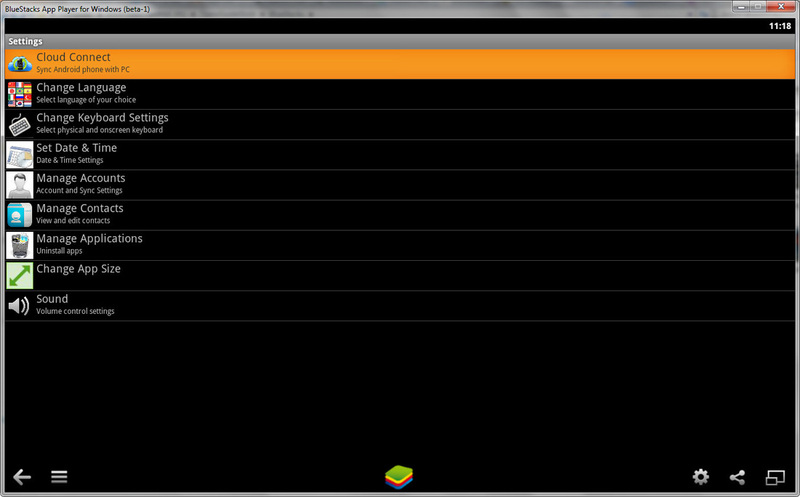 Search for and install ESFileExplorer. Click here to access further instructions. If you do not already have a Google Play/Android Market account, click here. Visit the Android apps section for reviews and links to awesome Android apps for educational settings. Download the BlueStacks Cloud Connect app on your Android device. On the Windows PC or Mac, open BlueStacks. Click here to learn how to locate Cloud Connect (pictured below).